What would you like stamped on each side? Max 15 characters per side, including spaces. Side 1 is the front and Side 3 is the back. Thank you! 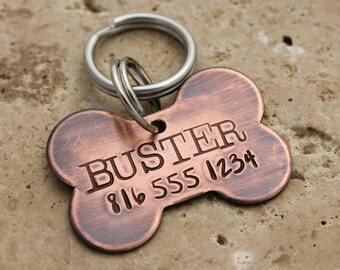 This four-sided copper bar dog tag is sure to get your pet noticed! 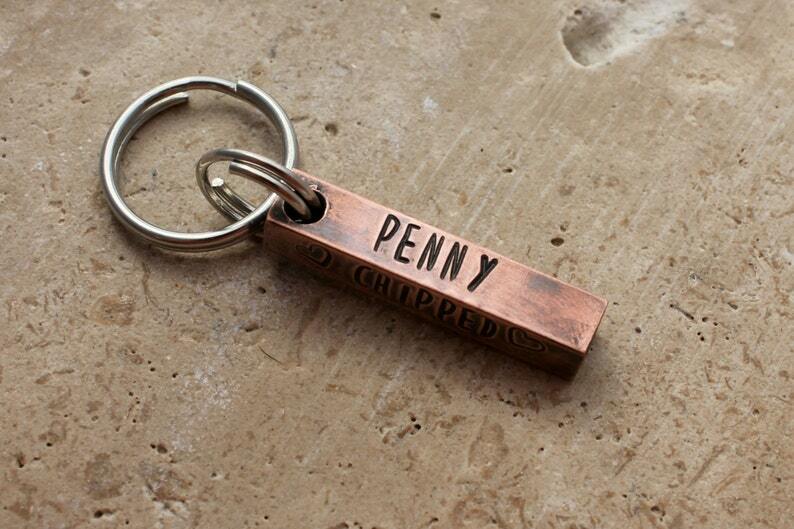 The tag is made of solid copper, which makes it very sturdy. The tag is 1/4 inch on each side and measures 1.25 inches long. It is the perfect size for most dogs over 30 pounds. 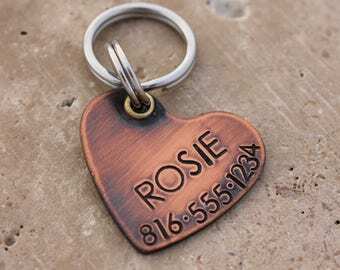 Each tag comes with 2 stainless steel heavy-duty split rings installed, so it will be ready for your pet to wear right away. 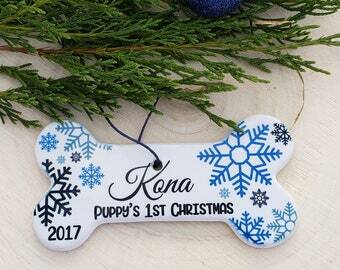 The best part about this tag is that it can be stamped on all four sides! 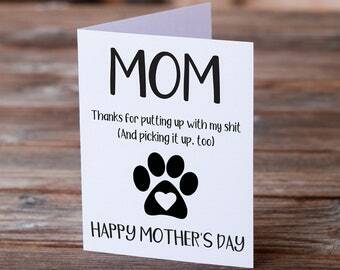 I recommend at least your furry friend's name on the front and a phone number on the back. The other two sides are optional. I can stamp a short saying such as "Chipped" or "Call my mom." 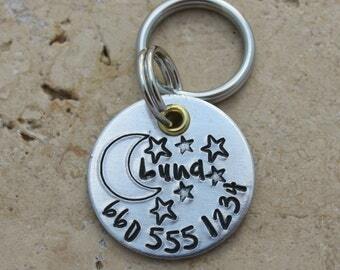 I can also stamp another phone number, an email address, even a short address or your choice of hearts, stars or paw prints for a cute touch. Feel free to customize!! Space is limited to 15 characters per side maximum (including spaces). I do NOT charge extra for stamping all four sides! The last sample picture shows the font choices available. Picture #1 is stamped with Lollipop font and Picture #3 is stamped with Tootsie Roll font. I hand stamp each piece a single letter at a time, which makes each tag absolutely unique. Stamping is much deeper than engraving. 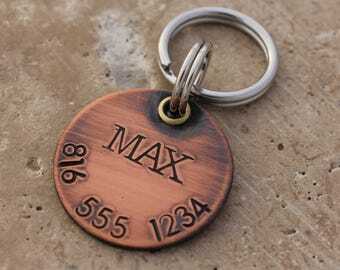 This is great for pet tags because these tags will remain readable even after crazy puppy antics. All tags also come coated with a DURABLE clear-coat sealant and are given an antique finish. In the "Notes to Seller" section, please be sure to include what you would like stamped on each side (up to 15 characters MAX per side). Side 1 is the front and Side 3 is the back. Side 2 is the side on your right as you're looking at the tag hanging on a collar, and Side 4 is the side on your left. If you have any questions or special requests, feel free to convo me. It came exactly as asked.fast shipping! We love it!